correct ion concentration for exact cell alignment (in all experiments). This greatly enhances reproducibility. A large selection of possible electrode configurations available. The electrodes have been specifically designed for the LF101 device. Both automatic and manual pulse delivery (number of pulses 1-99) modes avaailable. Pulse interval can be set in increments from 0.1 - 9.9 seconds. Voltage can be set in 1V resolutions. This is especially suitable for mammalian cloning. The device outputs a precise square waves which enhances cell fusion probability. The LF101 enables the researcher to output the DC pulse either automatically or manually. The automatic output mode facilitates routinework. The manual output mode enables the researcher to apply a DCpulse while using a microscope - this is particularly useful when working with unfamiliar cells and during nuclear transplantation. Specialized setting for bovine, pig, mouse, rabbit cloning. Somatic cell and embryo nuclear transplant results in extremely high fusion probability (e.g., more than 90% for bovine cloning). Specialized setting for plant protoplast and mammalian cell fusion provide optimal cell fusion conditions. Cell fusion achieved which a DC pulse (100V, Max) of precisely controlled voltage and pulse range after producing the pearl chains with DC. It can elevate the rate of hybridoma production (Cell fusion) probability. • Specialized settings for bovine, pig, mouse, rabbit cloning (Somatic cell and embryo nuclear transplant) result in extremely high fusion probability (for example: More than 90% for bovine cloning). • Voltage setting with 1V resolution is possible in the specialized setting for mammalian cloning. It is suitable to output precisely the square pulse wave shape and pulse range as preset and accordingly brings about a higher rate of cell fusion probability. • Specialized setting for plant protoplast and mammalian cell fusion can provide a desirable condition for the cell fusion, which is done with DC pulse (100V, Max.) of the precisely controlled voltage and pulse range after producing the pearl chains with DC. It can elevate the rate of hybridoma production (Cell fusion) probability. • Post fusion function for damage recovery of the cell can be operated with On/Off switching. • Operation of the device is very easy because both of automatic and manual (Number of pulses: 1-99) transmitting of the pulse are possible. And the pulse interval can be selected to set between 0.1-9.9 seconds. The device can keep a constant operating condition anytime. • A comprehensive selection electrodes designed specifically for the device is available. 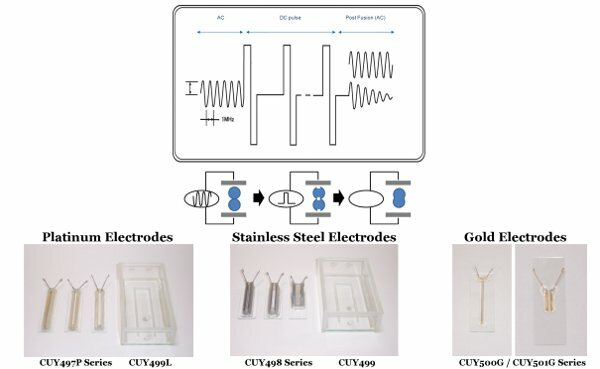 Using the specifically designed electrodes with the device facilitates very efficient gene transfection and cell fusion.